All 800 of them, sending their beloved team off yesterday. 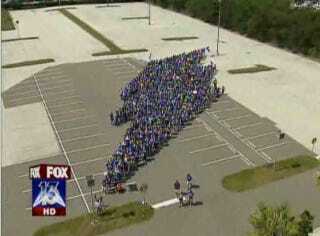 Organized on Facebook (of course) and by the team (grassroots it is not), every single man woman or child that roots or ever rooted for the Lightning gathered in a parking lot at Tampa International Aiport and stood in the shape of a lightning bolt for a couple of minutes so people could take pictures. Thanks for joining us. Go learn a new word today.